A seismoscope is an instrument that gives a qualitative measure of the oscillatory motion produced by an earthquake or other disturbance of the earth's surface. Unlike the seismograph, it lacks a device to calibrate the time. Several designs and variations exist, and many are easy to build with common materials. 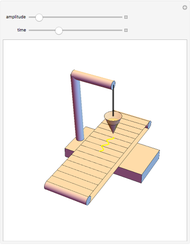 In this Demonstration, an oscillating cone filled with sand hangs by a string. The sand falls from a hole over a moving surface and draws the waveform that shows the general characteristics of the motion. For a general discussion see "Seismometer" on Wikipedia.